Please click above to go to the article on my October trip to Verona, (Venice, second part of the trip, will come later), published 12/09/16 on Go Nomad. Now for an accompanying recipe. You didn’t think I’d be nutty enough to give you a recipe for donkey as in the article did you? These meatballs are easy and can feed a crowd as part of a buffet or a small group as dinner. Heat broiler. In bowl mix onion, cream, egg yolks, cinnamon, cumin, red pepper flakes, and cayenne or other pepper. Add lamb. Season well with salt and pepper. Add bread crumbs and parsley and combine well. Make meat into balls just a little bit bigger than golfballs. Grease baking pan with olive oil and put meatballs on it, spacing evenly. Put in broiler and cook, turning once or twice until brown, about 5-7 minutes. Remove from oven. 3 inch strip of orange peel with white under part removed. Chop tomatoes or use blender to chop. Put olive oil in medium saucepan, heat a minute, add rosemary, red pepper, blend.Cook another minute, then add onion, thyme, cumin, bay leaf and cook about 7 minutes. Add tomatoes, sugar, orange juice and peel. Cook about10 minutes over medium-low heat. Add salt if needed. Pour sauce into a big baking dish (a lasagne pan works fine) that can go into oven. 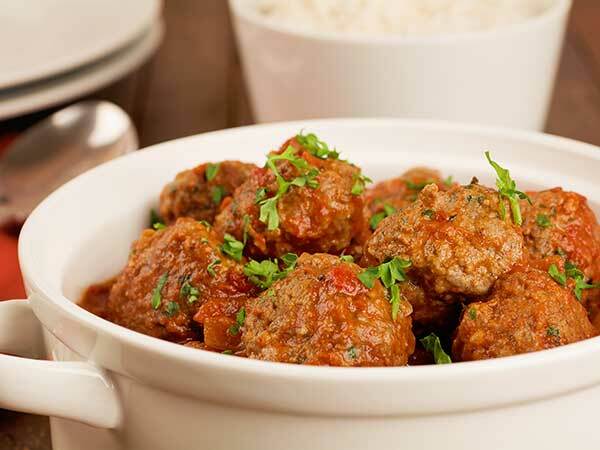 Put meatballs in sauce. Bake at 400 for 15-20 minutes until sauce bubbles and meatballs are cooked through. Serve w feta crumbled on top. Toast meatballs and Verona in Valpolicella. Or your house plonk. This entry was posted in Uncategorized and tagged Romeo and Juliet, Shakespeare, tomatoes. Bookmark the permalink.